diabetes e.g. 500mg daily and gradually titrated to 2g per day (or 3g under specialist supervision). -Continued in patients with Type 2 DM who require Insulin, as Metformin reduces insulin requirements. standard-release metformin, consider a trial of modified-release metformin. NICE NG28 recommends prescribing a sulfonylurea with a low acquisition cost (but not glibenclamide) when a sulfonylurea is indicated.  Inform patient of risk of oedema and what to do if this happens. Closely monitor patients during treatment with pioglitazone for signs and symptoms of fluid retention. Discontinue pioglitazone if heart failure develops. 45mg tablets: £11.71 (28) The PROACTIVE trial showed improvements in secondary outcomes. Pioglitazone might be preferable to a DPP-4 inhibitor if there is marked insulin insensitivity, or if DPP-4 inhibitor is contraindicated or not tolerated. Secondary or tertiary centres may recommend the use of pioglitazone in patients with advanced liver fibrosis whether they have diabetes or not according to NICE NG 49 July 2016. This is an unlicensed use-please note. 25mg tablets: £26.60 As a dual therapy add-on to other agents including insulin. Please note that the licence for alogliptin does not preclude any particular combination including triple therapy with metformin and a sulphonylurea (SU), and the use within this specific combination is not contraindicated. The safety and efficacy of alogliptin when used as triple therapy with metformin and a sulphonylurea have not been fully established. Vildagliptin 50mg tablets: £33.35 (56) Twice daily dosing. In dual combination with a sulphonylurea, the recommended dose of vildagliptin is reduced to 50mg once daily administered in the morning. 2mg tablets: £5.88 (90) Repaglinide may have a role in patients who fail to achieve target HbA1c with Metformin +/- Sulphonylurea, or when either of these two classes of drug are contra-indicated or not tolerated. Consideration should be given to a trial of Repaglinide before initiating a glitazone. Repaglinide may have a particular role in patients with an erratic lifestyle / irregular eating pattern. Repaglinide should be given in the 30 minute period before a meal, up to TDS. 100mg tablets: £19.00 (90) Acarbose may have a role for a person unable to use other oral glucose lowering medications (contra-indicated or not tolerated) or in patients who fail to achieve target HbA1c with Metformin +/- Sulphonylurea. Titrate dose slowly to reduce incidence of GI adverse effects. Due to recent studies suggesting an improved cardiovascular outcome, SGLT-2 inhibitors are preferred over DPP-4 inhibitors. NICE does not offer the alternative of combining an SGLT2 with a DPP4 (see algorithm below). Qtern (saxagliptin plus dapagliflozin) is therefore non-formulary. 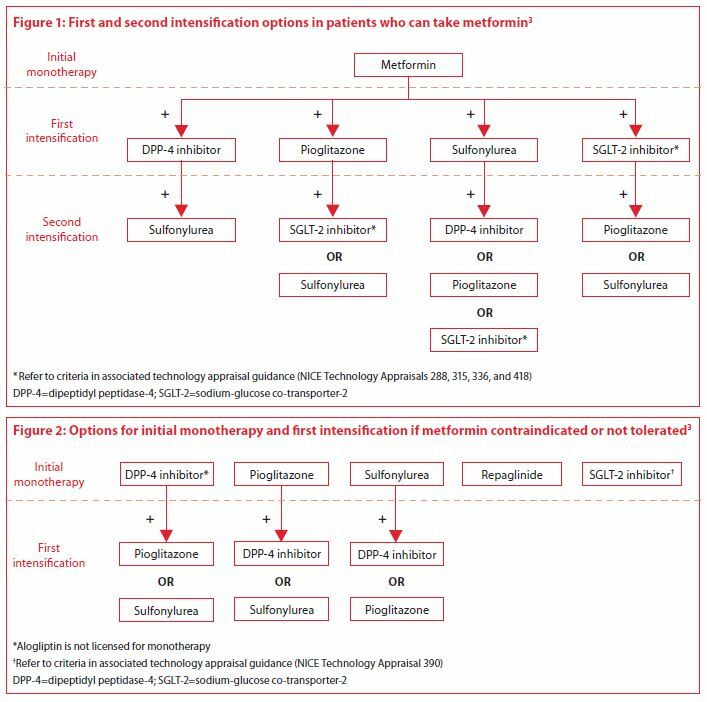 Monotherapy with an SGLT2 is only if all other agents are not tolerated or C/I. There is no intensification possible thereafter. 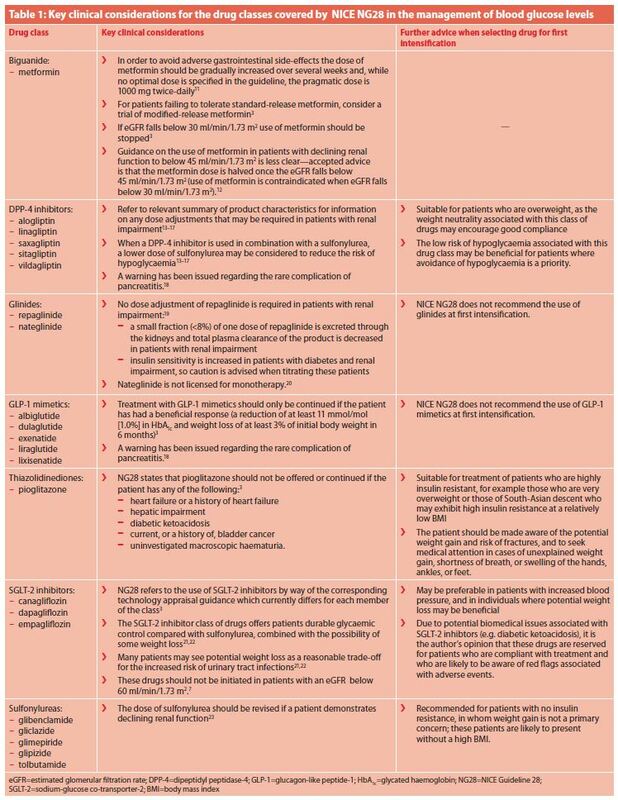 Treatment with combinations of medicines including sodium–glucose co-transporter 2 (SGLT-2) inhibitors may be appropriate for some people with type 2 diabetes; see the NICE guidance on canagliflozin in combination therapy for treating type 2 diabetes, dapagliflozin in combination therapy for treating type 2 diabetes and empagliflozin in combination therapy for treating type 2 diabetes. 25mg tablets: £36.59 EMPA-REG OUTCOME (Empagliflozin Cardiovascular Outcome Event Trial in Type 2 Diabetes Mellitus Patients) trial demonstrated that treatment with the SGLT2 inhibitor empagliflozin compared with placebo showed a significant reduction in the risk of major cardiovascular end points and hospitalisation for heart failure for patients with T2DM and existing cardiovascular disease. • Monotherapy. When diet and exercise alone do not provide adequate glycaemic control in patients for whom use of metformin is considered inappropriate due to intolerance. Type 1 diabetes- Dapagliflozin 5mg is now licensed for use in type 1 diabetes mellitus as an adjunct to insulin in patients with BMI ≥ 27 kg/m2, when insulin alone does not provide adequate glycaemic control despite optimal insulin therapy. - in addition to other medicinal products for the treatment of T2 diabetes. 15mg: £29.40 (28) Due to current lack of CVD outcome data we would recommend ertugliflozin is only used in patients without pre-existing disease. • as monotherapy in patients for whom the use of metformin is considered inappropriate due to intolerance or contraindications. Start with 5mg and increase to 15mg if greater glycaemic control needed. Discontinue when eGFR is persistently less than 45 ml/min/1.73 m2 or CrCl is persistently less than 45 ml/min. SGLT-2 inhibitors may increase the risk of lower-limb amputation (mainly toes) in patients with type 2 diabetes. Evidence does not show an increased risk for dapagliflozin and empagliflozin though manufacturers warn of the increased risk, which may be a class effect. Preventive foot care is important for all patients with diabetes. GLP-1 mimetic (Glucagon-like peptide-1 analogue) Dietary advice should be given before starting therapy with these agents. -have a BMI less than 35 kg/m2 for whom insulin therapy would have significant occupational implications or weight loss would benefit other significant obesity-related comorbidities. HbA1c and a weight loss of at least 3% of initial body weight in 6 months). NB Group 2 (LGV/PCV) drivers are required to notify DVLA if taking combination of exenatide with sulphonylurea. Somerset Prescribing Forum approved the use of lixisenatide and exenatide as adjunctive therapy to basal insulin (with or without metformin and/or pioglitazone in adults with Type 2 diabetes) i.e. within the respective licensed indications. Patients are expected to show 0.5% (6mmol/mol) reduction in HbA1c after 6 months to justify continuation. Starting dose: dosing is initiated at 10 mcg once daily for 14 days. Maintenance dose: a fixed maintenance dose of 20 mcg once daily is started on Day 15. Lyxumia 20 micrograms solution for injection is available for the maintenance dose. Also indicated as adjunctive therapy to basal insulin with or without metformin and/or pioglitazone in adults who have not achieved adequate glycaemic control with these medicinal products. £117.72 (3 x 3ml) Liraglutide 1.2mg daily can be considered for dual therapy (in combination with metformin or a sulphonylurea) only if either metformin or a sulphonylurea is contraindicated or not tolerated, and a DPP-4 inhibitor is contraindicated or not tolerated. For triple therapy see above. • Monotherapy when diet and exercise alone do not provide adequate glycaemic control in patients for whom the use of metformin is considered inappropriate due to intolerance or contraindications. • Add-on therapy in combination with other glucose-lowering medicinal products including insulin, when these, together with diet and exercise, do not provide adequate glycaemic control. When diet and exercise alone do not provide adequate glycaemic control in patients for whom use of metformin is considered inappropriate due to contraindications or intolerance. 1mg pre-filled pen: £73.25 (4 doses) For dual therapy. Semaglutide (Ozempic®) is licensed for mono and dual therapy, however NICE only recommend for dual therapy.